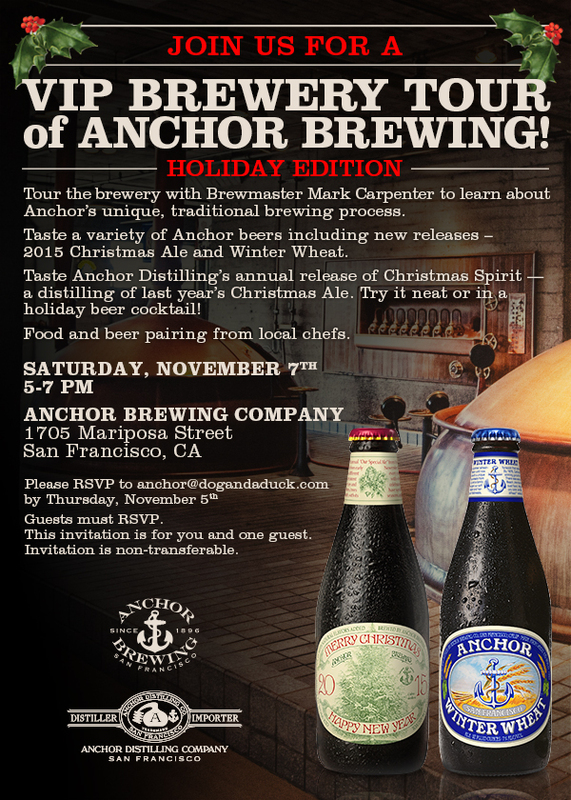 On November 7th I had the opportunity to partake of a VIP brewery tour of Anchor Brewing and Anchor Distilling in San Francisco. 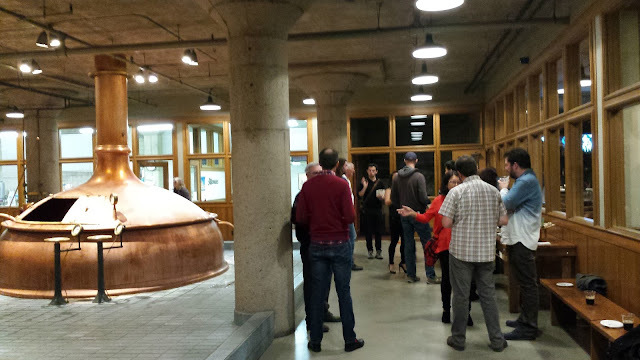 The event was Anchor's 2015 Media Brewery Tour to mark this year's release of their Winter Wheat Ale and the 2015 Merry Christmas and Happy New Year ale, from the brewery, and the 2015 Christmas Spirit from the distillery. 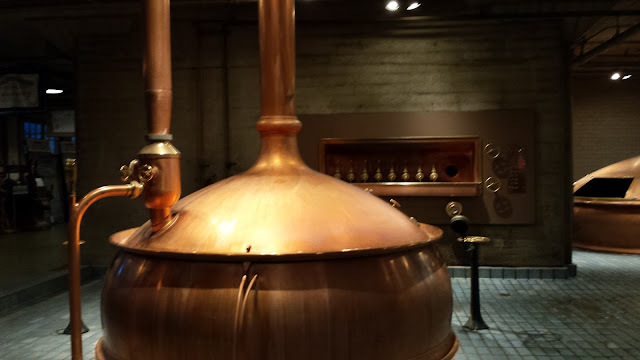 The current brewery is located on Potrero Hill in San Francisco, although there are plans to move to a new, larger location in the near future. 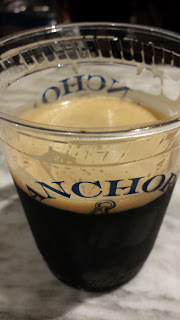 I had never been to the Anchor brewery, even though I had long wanted to visit it. Tours book up well in advance, so it has seemed hard to find a time when I could go on one, even though I now live within moderately easy driving distance, so I was pretty happy to receive the invitation to this tour. 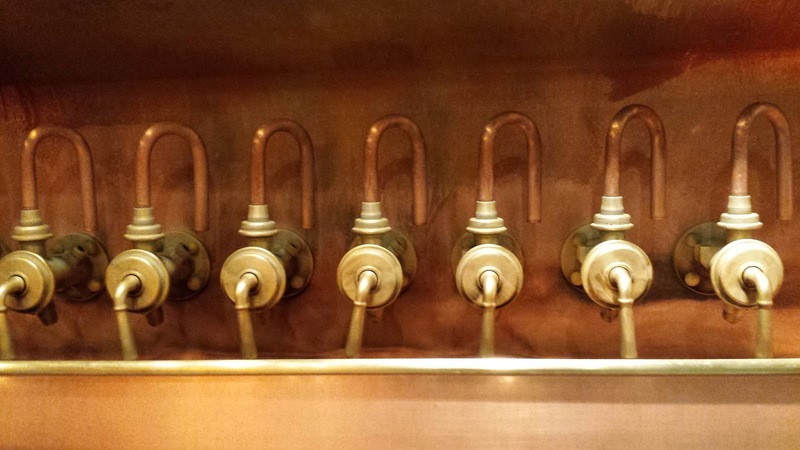 Upon arriving, and going up the stairs, one first enters the brewery's well-appointed tap room. 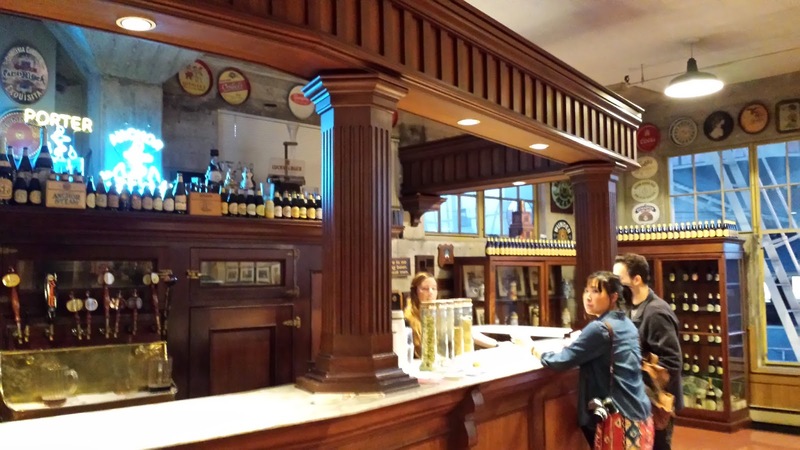 Aside from the handsome bar, the room is lined with cabinets and wall displays filled with curiosities and antiques relating to Anchor Brewing, steam beer, and brewing in San Francisco generally. 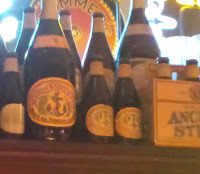 Behind the bar, lining the edge of the cooler, is a display of Anchor bottles, old and recent. Among the curiosities displayed there are two bottles of Anchor Steam with the labels upside down. 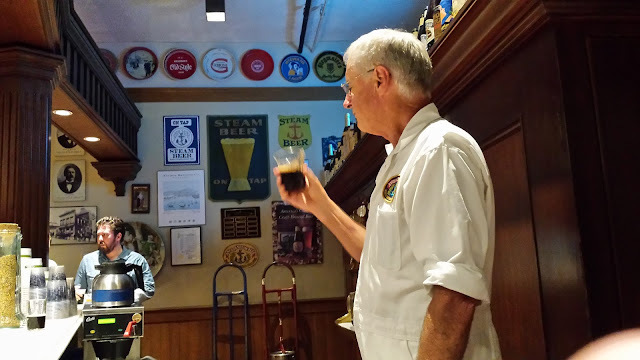 Mark Carpenter, who is the head brewer at Anchor, and who conducted the tour for us, shared that those were issued after the 1989 earthquake. When the earthquake struck and the power went out, the beer was still in the kettles. 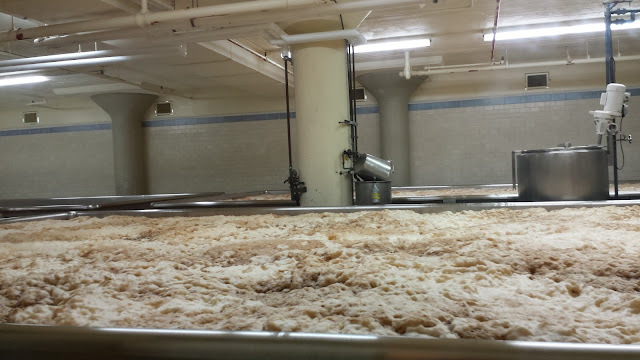 Mark and some colleagues, along with neighbors, stayed on at the brewery until the power came back on and they were able to transfer the wort to the fermenters. Because the wort had sat in the kettles longer than the usual, the finished beer tasted different than the normal batches. 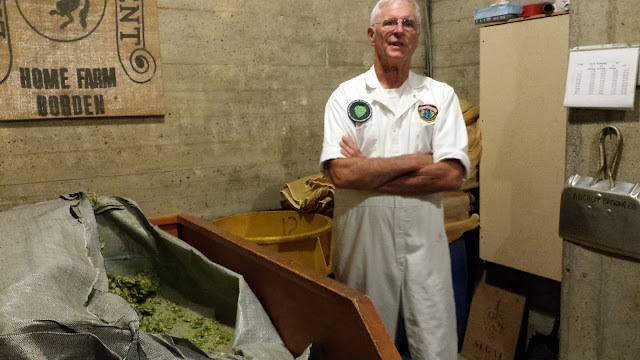 Rather than throw it out, then-owner Fritz Maytag decided to bottle and release it, but with a difference. Passing through the tap room, we were invited into the brewery proper. 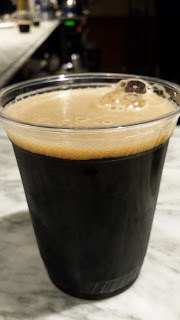 The guest list consisted of about two dozen bloggers and social-media types -hence my invite- who got to taste the new releases, enjoy hors d'oeuvres (including some yummy "lobster corn dogs") and learn about the brewery. The Christmas Spirit, of which this year's is the third batch released commercially, is made each year by distilling the previous year's Christmas ale and, like on the Christmas beer, the tree on the label is different each year. 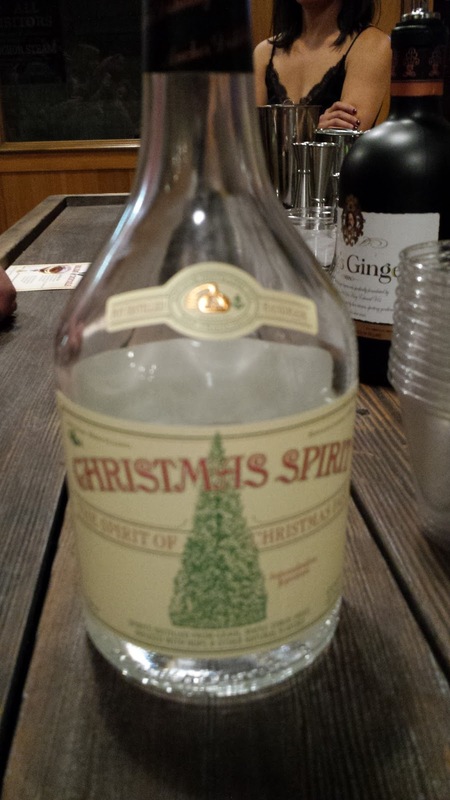 It is a clear, unaged whisky, which comes in at 45% ABV. After a bit, Mark started the tour by inviting us back into the taproom to tell us a bit about Anchor's history, and about the new beers. 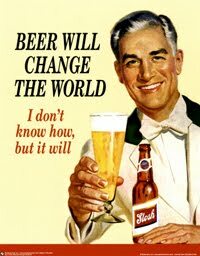 He explained that while the Winter Wheat is produced employing a steady recipe, arrived at after some tweaking and experimentation, the Merry Christmas, Happy New Year ("Our Special Ale") is different each year. As this is the 41st iteration of that beer, Anchor has produced forty-one different "Special Ales" in that time, and for 41 years fans have been kept guessing as to what has gone into each, as the brewery keeps the formulation a well-guarded secret. 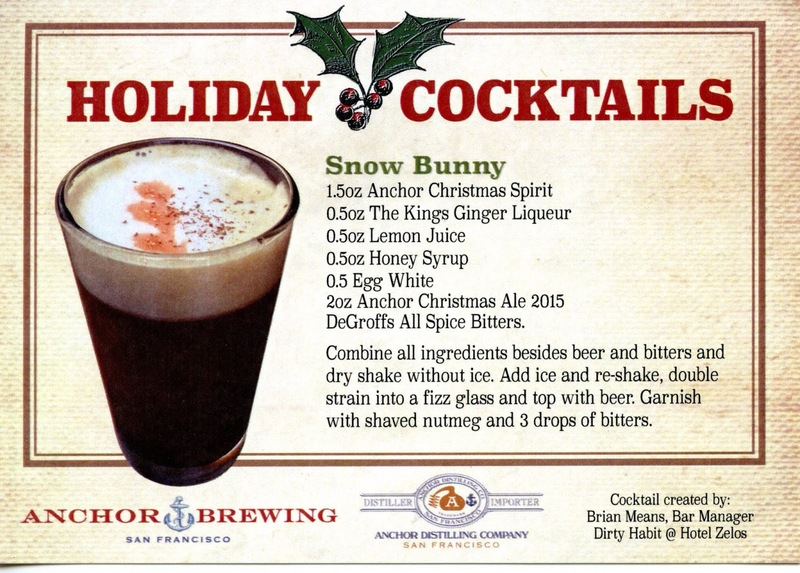 It is widely assumed that the recipe generally contains spices, and this year's very tasty Special Ale has a hint of cloves, which could be the result of cloves being part of the mix, or from the yeast --although Mark said they use the same house yeast strain in the Special Ale as they do in Anchor Steam and their other ales. In any case, Mark was coyly evasive as to whether cloves were present or not, however he did let out that the two spices that certainly do not go into the recipe are allspice and frankincense. 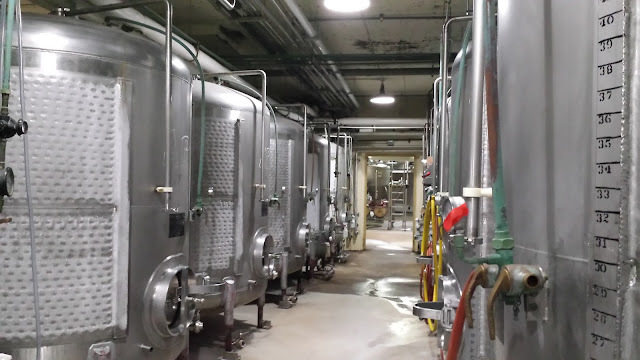 Then, after sampling the brews, he led us on a tour of the facility, from the brewhouse on the third floor to the cold room and fermentation tanks in the basement, to the bottling and canning lines, shipping warehouse on the ground floor. Anchor uses traditional open fermentaters for their primary fermentation. 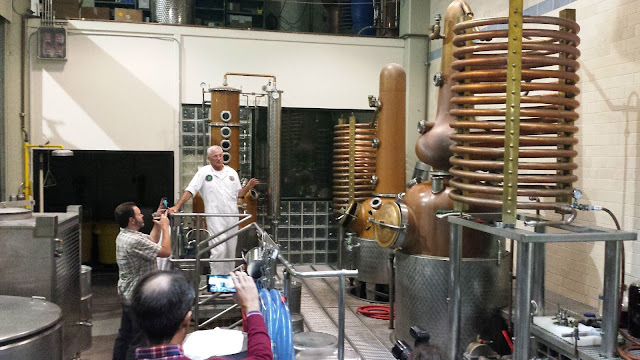 The last stop on the tour was the distillery . Anchor Distilling dates back to 1993, with Fritz Maytag's foray into spirits production with Old Potrero, an old-style pot-distilled rye whiskey. 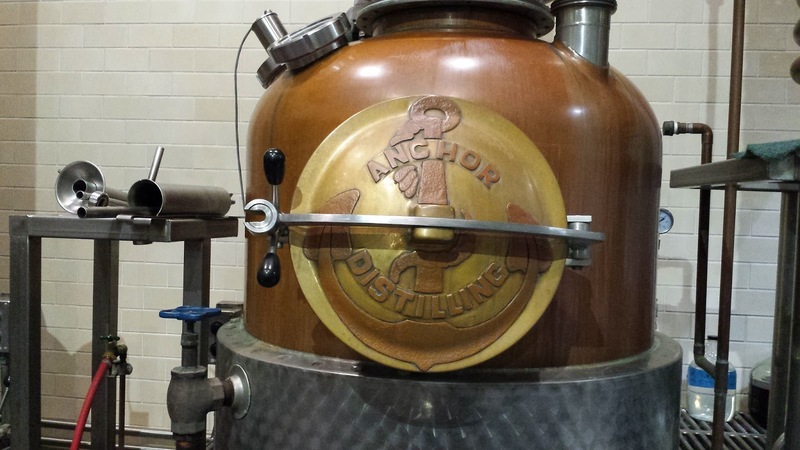 At the time, it was one of the few rye whiskeys being produced in the US and the only legally-produced commercial whiskey produced in a pot still (all others were produced in column or in continuous distillation stills). 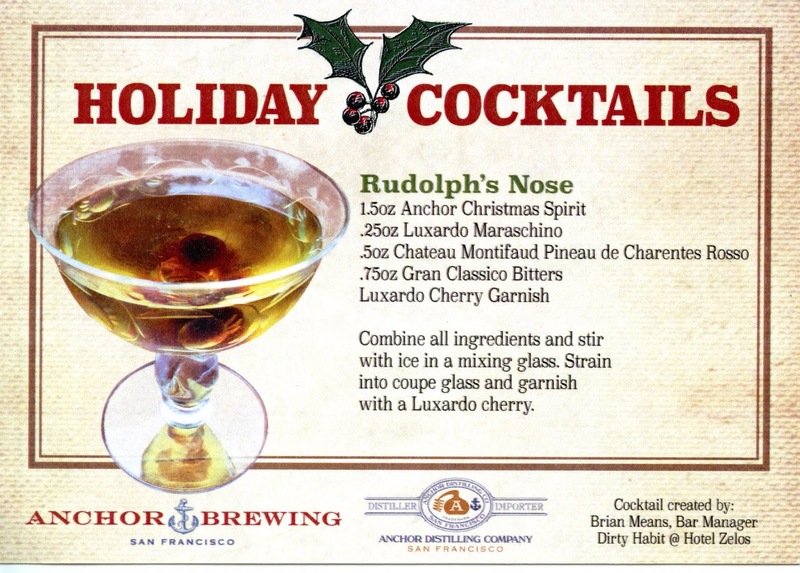 Old Potrero was followed soon after by Junipero Gin, and Genevieve Genever-style Gin. Today the distillery's offerings also includes two other variants of Old Potrero --an "18th Century" whiskey and an aged 16-year old one-- as well as an Old Tom gin, and Hophead hop-infused vodka. Afteward we repaired to the brewhouse and taproom for some more drinks, where I was pleased of the chance to taste a still-experimental IPA that Anchor was trying out for addition to it's beer lineup. 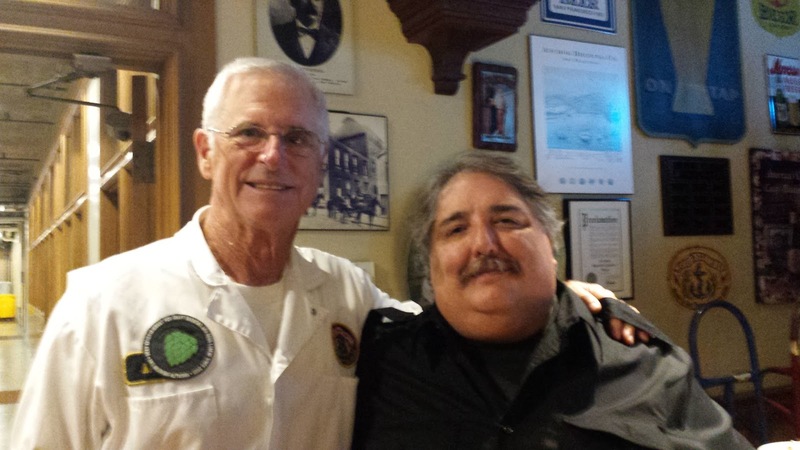 All in all, I had a really good time and it was great to meet Mark and visit what is an icon in the craft beer scene. © 2016 Juan Fajardo. Travel theme. Powered by Blogger.